Clemson is ranked #2 in Baseball America’s 2006 preseason poll, released on Thursday. The ranking ties for the highest in the program’s history in a preseason poll with the 2002 team that was ranked #2 by Baseball America. 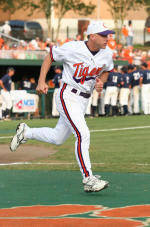 The Tigers, who were 43-23 and came within one game of the College World Series in 2005, are the highest-ranked ACC team. Clemson has made 19 consecutive NCAA Tournament appearances, tied for the third-longest streak in NCAA history, and returns all eight positions starters in the field. Defending National Champion Texas is atop the poll, followed by Clemson, Florida, Georgia Tech, and Cal. State-Fullerton in the top five. North Carolina (#6), Florida State (#15), and N.C. State (#24) are three other ACC teams ranked in the preseason top 25. Clemson finished the 2005 season ranked #14 by Baseball America. Clemson was ranked #6 in the preseason Collegiate Baseball poll in December. The Tigers open their 2006 schedule on February 17 against James Madison at Doug Kingsmore Stadium.